Ideal for use in all clay traditional therapies. 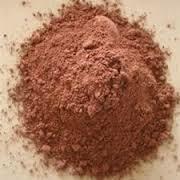 Red Kaolin Clays constitute ingredients which can be used in many different ways in natural skincare. Red Kaolin Clays its stronger drawing power or ability power makes it ideal for acne-prone and oily skin types. This clay is rich in iron oxide and copper and low in aluminum and it was traditionally used in treating abdominal pains, joint pain and washing to protect oneself from infections and disease. Red Kaolin clay has anti-inflammatory property good in treating skin that is inflamed and gums. It relieves pain caused by contusion, hematoma and bruises. It’s also reduces swelling on affected areas. Like the other Kaolin clays, it also stimulates blood circulation. Clay provides an impressive assortment of minerals, including calcium, iron, magnesium, potassium, manganese, and silica as well as trace elements - those appearing in very tiny amounts. Without the basic minerals, life cannot exist; without the trace minerals, major deficiencies will develop. The lack of either will make it impossible for the body to maintain good health.